Used for the purpose of measuring the quantity of blood and prevent it from clotting, the offered range of Blood Collection Monitors is highly asked for. Made using the finest technology available, its functionality is unmatched. Quality Blood Collection Monitors and Plasma Expressers make up this commendable range. The unit is Microprocessor controlled, with LED digital display of volume, weight, flow rate, audiovisual alarm, motor activated clamping and auto calibration. ² Having memory of previous volume for repeated collection. ² Automatic counter balancing to start the procedure. ² The Tarring range is 0-999 gm. i.e. tarring of bag weight before collection. ² Automatic clamping at termination of preset volume collection. ² Having gentle mixing i.e. continuous agitation 12-20 cycle/min. ² Complete indication and audio alarm at the end of collection. 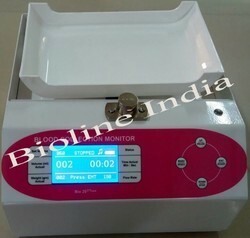 ² Measure volume / weight with best accuracy ±1 ml. / gm. ² The instrument is having audio alarm when blood flow is more than 180ml (high blood pressure) and less than 20ml (low blood pressure) within 60 seconds continuously display the flow rate. ² By repressing the pause key again previous programmer can be activated. Audio Visual Alarm is provided for Completion of volume, high low flow of blood and preset time completion. Looking for Blood Collection Monitor ?